As businesses and government become more and more dependent on computer technology, the need to remain constantly connected to customers, sales staff, vendors and management is becoming norm. In this increasingly wired world, the ability to keep systems online and secure is tied directly to productivity and success. 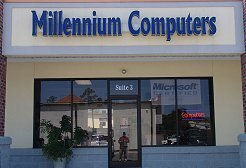 A Computer Network Solutions provider, Millennium Computers is a single source for all your computer needs. Our focus is providing solutions that increase your office efficiency and productivity, thus improving your bottom line. Founded in 1996, Millennium Computers specializes in creating network solutions for office computer systems. Our certified technicians are trained to tackle the most challenging and frustrating network problems. We will access your system and design and optimum solution to enhance efficiency - and, very likely, your company's profitability.